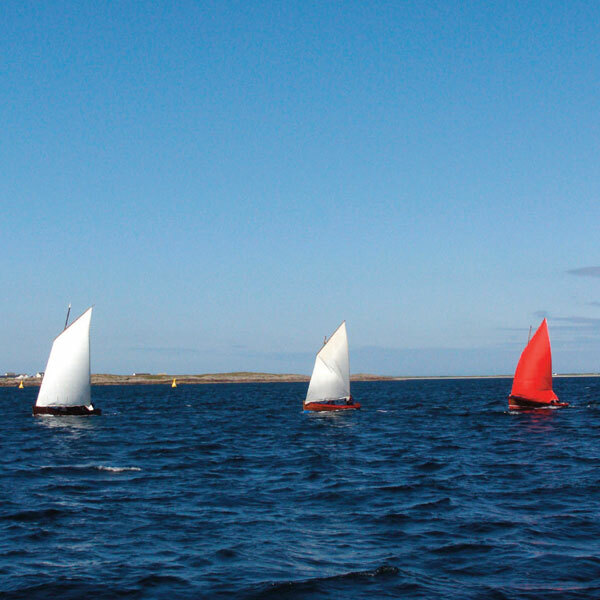 The project was funded by the Heritage Lottery Fund, Leader, The Tiree Regatta Club and the Tiree Maritime Trust. Three two week traditional boat building courses were organised over the winter 2009/10. 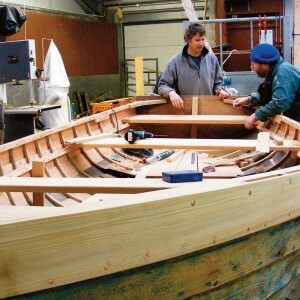 The courses were led by professional qualified boat builders from A R Way Boatbuilding in Lochgilphead, Argyll. Twenty two local people from age fifteen to retired participated in the courses. 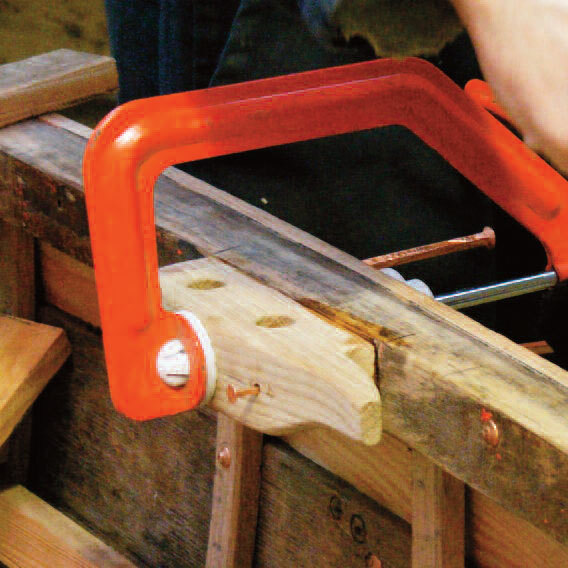 Tools and equipment were bought for the courses and a temporary fully functional boat building workshop was set up in the livestock auction ring at the Tiree Rural Centre. 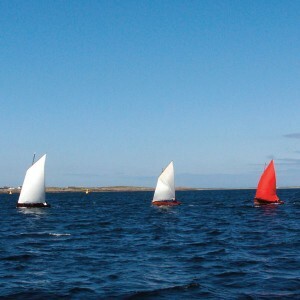 Carefully selected timber, including Argyll grown Scottish Larch, was shipped to Tiree for the renovation of the boats. The courses began with many hours of scraping, careful dismantling and assessing the condition of the three boats. Sadly the backbone (stem, keel, stern post and transom) of the Ros was found to be completely rotten. With only the top three planks, the gunwale and thwarts still sound, work on Ros had to be abandoned as she was considered beyond repair. Both the Morag Anne and the Daisy were also in need of extensive repairs. 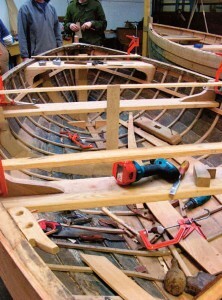 After careful measuring and pattern making the existing rotten stem and keel of the Morag Anne were cut away. New oak replacements were made and fitted. Next a new stern post and transom were fashioned and aligned in such a way as to correct a twist that had developed in the Morag Anne’s hull. With a strong spine in place work then started on replacing a number of planks. Each new plank was carefully patterned from the original paying particular attention to the detail of the bevels where the planks meet. Every plank took more than a day of diligent work to complete. Replacement ribs were then steamed and fitted to the planks with copper nails and roves, a two-man job that requires great coordination. Next the seating and mast thwart layout was determined taking account of the various modifications that had been made to the internal space of the Morag Anne over the years. New knees, risers and thwarts were manufactured and installed. She was finished off with new cleats, a new rudder and tiller and new sole boards. At the same time another team was working on the Daisy. Her stem was not as far gone and a new stem head was crafted and let in to place. She too received a new stern post and transom, replacement planks and new ribs. Again the Daisy had undergone a number of alterations and repairs over the years and much debate went in to the positioning of her new seating and mast thwarts. Unusually the Daisy originally had thole pins instead of rowlocks. 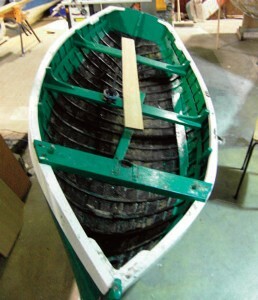 In restoring this feature her gunwale was reinforced to take the rubbing of the oars and new oak pins were made. Separately a number of the participants worked on making two new sets of oars. Starting off with rough sawn timber these were carefully shaped in many stages to ensure that the finished oars were light, well balanced and strong as well as being beautiful to look at. 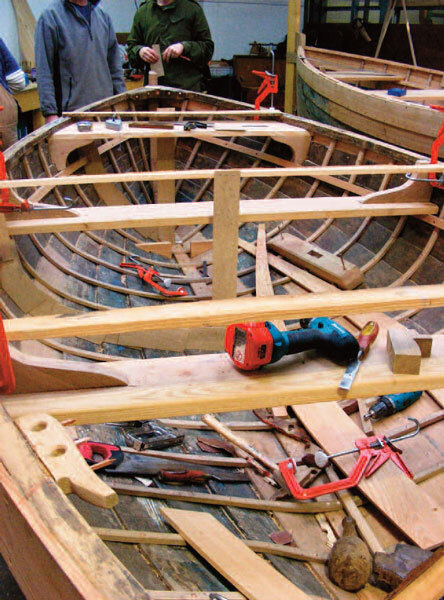 Detailed measurements and patterns were also taken from the Morag Anne with a view to building a complete new boat in the future. Throughout the course the participants worked side-by-side with the expert boat builders, often late in to the night. With patience and gentle guidance Adam and his team shared their skills and knowledge of traditional boat building with the eager students. As a result the quality of renovation work produced was of the highest standard and the Morag Anne and Daisy were rescued from decay and should now be fit for many more years of sailing.